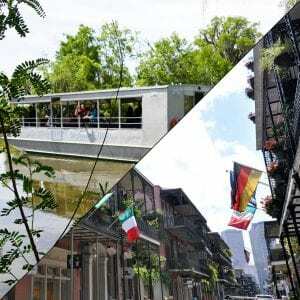 If you are interested experiencing all that New Orleans has to offer, the City/Katrina Tour and Swamp Boat Tour is the perfect combination tour. Spend an unforgettable 3 hours on our comfortable air conditioned Mini-bus and get an overview of New Orleans. As part of this tour, you will view the area damaged when the levee broke during Hurricane Katrina and swept the residents and their homes away. Next, see the land of Cajuns of the Bayou living and surviving in harmony with the swamps and see the swamp come to life with birds, snakes, turtles, fur animals, and of course Gators. This tour includes hotel pick-up and ground transportation. Crown Point is only 35 minutes from New Orleans yet a world apart. See the Cajuns of the Bayou living and surviving in harmony with the swamps. Here, the waterways are their highways. From the relaxed comfort of our covered New Orleans Swamp Tour Boats, we will drift slowly past a 2000 year old Indian Burial Mound, a Cajun cemetery and Fishing village! You may see the wildlife that made the Barataria Swamps the Crown Jewel of the Louisiana Purchase. Here, birds, snakes, turtles, fur animals, and Gators are the king of the swamp and easily spotted in Spring, Summer, and Fall. Gators do hibernate during the cold winter months, but lay on the bayou banks on warmer days. So even in Winter, our native Captains can sometimes find a sunning Gator on our tour. The slow drift of our tour boats through moss draped trees and small waterways, will provide ample opportunity for viewing and photography. The New Orleans swamp tour boats are fully narrated and our captains are natives of the Barataria Swamps with a background of gator hunting, fishing and trapping. They will entertain you and amaze you with the ecology of the swampland. They truly have lived the life! Your Comfort is Guaranteed on Our Tour Boats. Our Swamp Tour Boats that are specially designed for your comfort. They have a roof, restroom, cushioned seats, and windows that can be raised or lowered during cold or rainy weather, along with plenty of standing and walking room. These tours are Entertaining, Educational and Exciting. It provides you with a relaxing view of our beautiful swamps. Your ground transportation will arrive starting at 9:30am at the curbside of your hotel. We use our sister company, “Alert Transportation” for the ground transportation service. The driver will go hotel to hotel to pick up our guests. Please allow us up to 30 minutes for the pick up process. The city tour will begin as soon as everyone is aboard and there will be a 20 minute break in the middle of the tour for snacks and restroom . You will spend an unforgettable 3 hours on our comfortable air conditioned Mini-bus and get an overview of New Orleans. Experience the history and culture of the Creoles with your licensed tour guide. No trip to New Orleans would be complete without seeing the highlights of our city and the some of the areas affected by Katrina’s flood waters. Your tour will end about 1:00 pm, when you will be transferred to our swamp tour vehicle. The driver will take you to the swamp tour dock, where you will arrive by 1:45pm. There is a snack and souvenir shop with candy, chips, microwave sandwiches, muffins and drinks. There is no time for a sit down lunch. Travel time is about 35 to 40 minutes to the swamp tour dock. After arrival, you will go to the ticket booth to get your boarding pass. The Swamp tour begins at 2:10 pm. You will spend about 1 hour 40 minutes on the swamp tour. On this tour, you will enjoy a fully narrated swamp tour by one of our local captains in the comfort of a swamp tour boat. Our tour boats feature a roof, cushioned seats, windows that can be raised or lowered for the weather, restroom, and plenty of standing and walking room. You will enjoy close encounters with the indigenous swamp life as you learn about what it is like to live in the Louisiana swamps. The options on the combo tour are: (1) do the tour as described above (no notification is required) (2) to split it into different days or (3) do the swamp tour at 8am pick up, return to the hotel at the end of the swamp tour, drop off at your hotel by 12:15 pm – get an approximate 1 hour time in between the two tours. Pick up begins at 1:30pm for the City Katrina tour that will end about 5:00 pm. To get one of these options, you can call to our office at 504-689-3599 to talk to one of our ticket agents or send an email requesting the schedule change.